"This witty satire... clever dialogue... adept cast... adrenaline-chaarged... a fascinating web of ideas." "A funny, entertaining and often thought-provoking play." Each character is excellently crafted and well-defined. All the effort has been made to create a sense of realism... and praise for that has to go to director Benet Catty. From the acting to the razor-sharp script and everything in-between, the production is a joy to watch. Go and see it." All the characters have a vested interest which director Benet Catty carefully teases out over the course of his well-paced production. "Quick-fire and sharp with a witty bite: the kind of theatre that takes you away for a few hours and wraps you up in its world. The lighting is smooth and professionally executed, highlighting the quality of the production. The show is worth seeing for the technical elements alone. Benet Catty's direction doesn't put a foot wrong... with an air of ownership and assurance often missing from fringe theatre. As a whole this ensemble are extremely well cast.... a five star powerful and unforgettable theatre production. Lucid Muse is a company to watch and director Benet Catty is certainly a man to keep tabs on. He has a great repertoire of award-winning work and DAMAGES is another success to add to the ever growing pile. 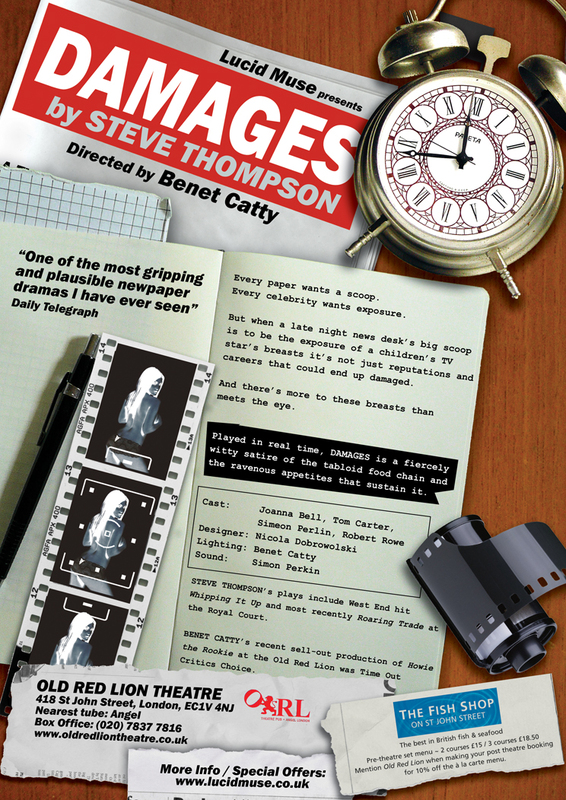 DAMAGES is must-see fringe theatre with a cast and director who make this writer shine again in revival. Don't miss it!" "Brilliantly written, complete with sharp cynicism, quick wit and contentious questioning." "Aptly and subtly set and directed by Benet Catty, this production delivers exactly what it promises... a hallmark for the detail, care and assurance that stamp the production. Here is an evening that is worth the price of the ticket for the acting alone. This is seriously-worked, concentrated playing of the sort that never fails to delight. The high-stakes, high adrenaline struggle between these four characters. A kind of savage chamber music."